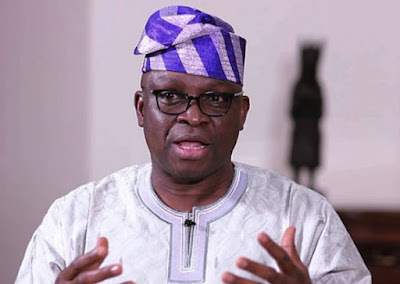 The Governor of Ekiti State, Ayodele Fayose, says the decision of the Independent National Electoral Commission to accept Mr. Jimoh Ibrahim as the candidate of the Peoples Democratic Party was evidence that the commission is aiding the All Progressives Congress to influence the poll. Ibrahim, who was chosen by the Senator Modu Sheriff faction of the PDP, was picked by INEC over Mr. Eyitayo Jegede (SAN), who was presented by the Senator Ahmed Makarfi faction of the PDP. Fayose, however, insisted the development showed that the commission had double standards and was aiding the APC. “With the development in Ondo Guber election and the decision of the Independent National Electoral Commission (INEC), it is clear that INEC is a department in APC led federal government,” he said. He argued that Ibrahim did not emerge through any known electoral process as the candidate of the PDP, adding that his acceptance was another plot by the APC to seize control of the state. He said, “The APC has decided to rig the Ondo State election even before it is conducted and this is sad commentary for our democratic process that was near perfection before the advent of this APC government. The commission’s decision led to protests in the state on Friday.